There are a number of quadratus lumborum stretch that can be used to help prevent low back pain. For example, a simple side stretch can open up the quadratus lumborum muscle and reduce the chance of an injury or spasm occurring. The insertion of the quadratus lumborum muscle is on the 12th rib and hence this is the rib it helps to fix during expiration. From this point, it runs downward, although it also has attachment points on the L1-L4 bones of the spine. The origin is on the iliac crest, and the innervation is via the subcostal and lumbar nerves. Its blood supply comes from the lumbar arteries. Its main action is to help flex the trunk of the body sideways and is involved in a large number of twisting activities. The muscle is also involved when a person lifts an object and helps to fix certain ribs during expiration. Due to the muscle’s involvement in a range of daily activities, it can commonly cause back pain and is often the subject of physical therapy. 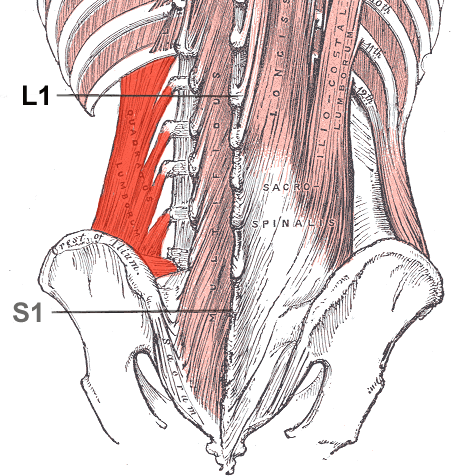 The quadratus lumborum muscle is a common source for pain in the lower back. This is because the QL muscle attaches to both the spine and the pelvis and therefore is regularly involved in daily activities. Due to the muscle’s position, it often has to take over some of the excess strain from other muscles, which can result in fatigue. When the muscle is placed in an over-stretched and loaded position for a long period of time, it will eventually start to spasm, which can cause pain. While stretching and strengthening the QL are indicated for unilateral lower back pain, heat/ice applications as well as massage and other myofascial therapies should be considered as part of any comprehensive rehabilitation regimen. 1. Sit comfortably, with your spine lengthened. Place a towel or stretching strap under your right foot, and hold the other end in your right hand. Side band to the right side as far as you can, taking up any slack in the stretching strap. This lengthens the left Quadratus lumborum. 2. Using the stretching strap to prevent your motion, try to sit up straight, isometrically contracting left quadratus lumborum for 6 seconds as you keep breathing normally. 3. After the isometric contraction, relax, breathe, and deepen the stretch by bending farther to the right. 1. The patient is supine on the table. The physiotherapist firmly grasps the right foot and ankle and passively stretches the entire leg to pull the hip down, then across the midline, lengthening the QL on the right. 2. From this starting position, the patient attempts to hip hike ( pull the hipbone towards the head). Be sure he is not lifting the leg toward the ceiling (hip flexion). Hold this isometric contraction of the QL for 6 seconds as the patient breathes normally. 3. After the isometric push, the stretcher relaxes and inhales deeply. As he relaxes, maintain the leg in the starting position. 4. As he relaxes, passively stretch the leg down and across the midline farther, deepening the right quadratus lumborum stretch. 1. The patient is lying on his left side, with his back at the edge of the table and his right leg hyperextended and hanging over the edge of the table. He has his left leg bent and as close to his chest as possible. Be sure he keeps his hips stacked vertically on top of each other. He reaches his right arm up over his head. This lengthens the right QL. If the patient experiences any low back pain in this position, he may bend forward from the waist to round his low back while keeping his leg hanging off the edge of the table. 2. Physiotherapist stands behind the patient. He crosses his arms and places his left hand against patient's right iliac crest; right hand is spread wide and placed on the lateral aspect of rib cage. This cross hands position gives a better mechanical advantage to resist the isometric contraction of QL. 3. Patient education begins now. Patient contracts the right QL by bringing the hip and the ribs towards each other. He is side-bending and hiking his hip at the same time. 4. Once the patient can perform the motion, ask him to begin slowly to try to bring the top of his hip and rib cage toward each other. Physiotherapist applies matching resistance to prevent any motion from occuring. Control the force of his effort. 5. After the isometric push, the patient relaxes and inhales deeply. As he relaxes, allow his leg (and his leg) to drop towards the floor. 6. As he exhales, ask the patient to pull his foot closer to the floor and reach farther up over his head to increase the stretch on the right QL.